Boat Crunch Pontoon Boat Camping: Prepare yourself for camping excitement! Ever thought about using your pontoon boat for a camping trip? Well I’ll tell you straight away, it’s a great idea! 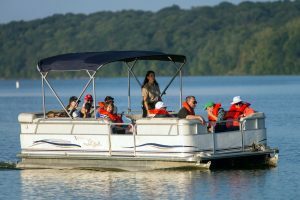 Your pontoon boat can make for a very inexpensive and enjoyable camping trip. This is a ton of fun for the whole family. It’s a great way of escaping the stress and troubles of everyday life. Get away for a bit and isolate yourself from the city. If you plan on camping with your family, your kids will surely benefit from being disconnected from their computer and other electronics for a while. It’s also a great way to bond with friends and family, get to know each other a bit more. Pontoon boat camping takes a little preparation but it’s not difficult at all. This guide has been created to prepare you for your camping session. It’s important to be able to identify a good pontoon camping site. I’ve also included a list of items you’ll need for camping on a pontoon boat. It’s very important that you understand park regulations. Different states and parks will have different regulations. Certain parks may require you to have possession of a license or permit to camp in your boat. This is like fishing; my local park requires a fishing permit to fish legally. Certain lakes have regulations which prevent boaters from tying their boat up overnight. If this is the case, then you won’t be able to camp overnight which defeats the purpose. Some lakes/rivers will even state that they do not allow camping at all. You’ll have to try another spot if you run into problems such as these. What I’ve found is many spots require a camping permit, and some require you to pay a fee. For example, Point Reyes National Seashore has a fee and permit system in place for overnight camping. Some spots will have a limit of how many people you can take on your camping trip. It may be a good idea to ask around and see if anyone knows of any good spots for boat camping. You may find that one of your boating neighbours go on frequent boat camping trips and know of a few good spots. Ask around at the dock, it doesn’t hurt to ask. Don’t think you can just pull up anywhere and set-up camp. You may think you could get away with hiding out on a large lake. Some spots may look deserted and quiet but it’s likely that it’s private property and you could get caught. Pontoon boats are designed to be pulled to shore and beached. This makes them great for hauling your camping gear. Regardless of whether you choose to pull your boat onto shore or just anchor in the water, you’ll want to find a cove to provide you with protection. A calm channel where you won’t be fighting against waves would also be suitable. It’s just important that your boat doesn’t drift out to open water whilst you sleep. I’d recommend that you pack a spare anchor just to be safe. Bring extra line as you could tie your boat to a tree on the land. Download a GPS anchor alarm application. This will alert you if your boat begins to drift away during the night. This is highly recommended and will keep you and your family safe in your sleeps. You can download these app for free on iTunes or the Google Play Store. Just like when it comes to traditional camping in a tent, you’ll want to plan your trip accordingly to the weather. You don’t want to prepare yourself physically and mentally for your trip, only to have to cancel it a few hours before. The weather can be very unpredictable so don’t go off your senses. Check your local new stations weather forecast, they tend to be reliable. There are also many different boating apps for your phone which will tell you about weather conditions and alert you if the weather would interfere with your boating trip. Even if the weather is forecasted to be nice and dry, I’d always recommend being prepared with the right pontoon boat accessories. I’ll explain what specific items you need later in this guide. Tents can be a good alternative to a full canvas enclosure. Just because you’re using your pontoon boat for camping doesn’t mean that you can’t bring a tent. Bring a tent and set it up on your deck. You’ll then also have the choice of camping on or off water, tents provide versatility. Just make sure your tent is a suitable size for your boats deck. If you do decide on using a tent and pitching it on your deck, then you’ll find that you must tie off your tent using the eye holes. This is because there’s no ground, typically you’d stake a tent into the ground. Use a zip-tie or bungee-cord to secure your boat, protecting it from the wind. Though tents are a good alternative, enclosures will always work best for camping on your boat. Enclosures will seal off your boat from the outside, acting like a large tent. If you get a full canvas enclosure, you’ll have complete privacy and protection from bugs such as mosquitos. I’d highly recommend you invest in one, they provide protection from the wind, rain, sun and are perfect for camping. Perhaps you don’t want to be completely sealed off, or you just can’t afford to invest into a full canvas enclosure. In this case, a half enclosure will still do a good job. Check on my guide on Pontoon Boat Enclosures for more information on these products, with recommendations and loads more. Just like you’d do if you were camping traditionally, bring sleeping bags with you! Sleeping on the floor of your boat with some blankets just won’t do the job. A sleeping bag will keep you warm and snug during the night. Get yourself a nice comfortable one, I’d recommend the Coleman Adult Sleeping Bag. This sleeping bag will accommodate for any up to 5 ft 11. It is made from 100% and filled with 100% cottons so it’s sure to keep you nice and warm. The Coleman sleeping bag also comes in 3 different styles so I’m sure you’ll find something you’ll like. Sleeping pads are another alternative, they work great! Though it’s important that you get a high-quality camping pad. There’s a lot of low-quality pads which won’t keep you warm during a cold night. I’d recommend this Sleeping Bag by Teton Sports. This is a comfortable, thick camping bad which will feel just like your bed at home. It features an open-cell foam pad which keeps it shape. This product promises to provide you with the most comfortable camping trip possible. It is very lightweight and portable. With built in roll-up straps and roll assister, as well as compression buckle, it’s never been easier to store and transport a camping pad. This is a top-class product. If you decide that pontoon camping is an activity which you want to do frequently then it may be worth upgrading one of your boats seats into a pull-out sofa. This will allow you to turn your boat seat into a sofa whenever you want, making for convenient camping trips. I mean, you could sleep along your seats as they are more that wouldn’t be very comfortable. Your boat seats as they are, are probably extremely narrow and wouldn’t leave you with much wiggle room. If you plan on showering during your camping trip, then you’ll want to invest in a solar shower. I’d recommend this Solar Shower by Advanced Elements. This is a 5-gallon outdoor shower, powered by solar technology. The product is made from 4-ply construction containing an insulator panel, helping generate warm water quickly. It has a user-friendly ON/OFF shower head. Features a small side pouch, useful for holding your soap and shampoo. This is the perfect product for keeping you squeaky clean during any outdoor trips. Keep your camping trip sanitary and clean. At some point you’ll need to use the toilet, every boater’s worst nightmare. It’s not good for the environment and other people who plan on using your spot in the future to release your bowels on the ground. To combat the toilet issue, you’ll be glad to know that there are small toilets made specifically for pontoon boats. They’re called porta-potties. I have a detailed guide on Portable Toilets. There you’ll find a ton of information these portable toilets, as well as some recommendations for your trip. Though, I’ll tell you now that one of my favorites is the Portable Toilet by PartySaving. It is simply and outstanding toilet which will last you a long time if used properly and maintained sufficiently. If you really can’t afford to invest in a portable toilet then you may have to become one with nature. IF this is the path you decide to go down, you’ll have bring a shovel or a trowel so that you can sanitarily expose of your waste. Make sure you do this far away from your camp. Lucky for us our waste is biodegradable, and soon after being left and buried it will be consumed by nature. Now for your rubbish and trash. You cannot simply bury non-biodegradable and expect is to disappear. You’ll have to seek the closest trash can, or dump station. Most campgrounds will have one nearby. Also, don’t just store all your junk on your pontoon boat. It’s never a good idea to invite rodents and critters onto your boat. Get yourself some trash bags so that you can accumulate all your trash together, making it easier for you to dispose of. If you can’t find a bin, then hang the trash bags from a tree so that unwanted guests cannot access them. Don’t forget to take them with you when you’re leaving! Bring something to help clean-up, some hand sanitizer, some soap, some paper towels would be great. These are all things which you probably already have at home. This is the most important part of your camping trip. You could live without a portable toilet or a sleeping bag. However, food and drink are essential for your well-being. It’s also a good idea to keep your cooking simple, don’t over complicate things and make your trip less enjoyable. You could prepare you food before your trip in the form of sandwiches and food stored in Ziploc bags or wrapped in foil. This would be the easiest and most simple way of eating during your pontoon camping trip. If you prefer fresh food, you may want to bring some meat and a grill. This is arguably more enjoyable and tastes much better. Trust me, BBQ’ing on your pontoon with a bunch of friends or even just family is extremely fun. Check out this article on the Best Pontoon Boat Grills. These grills will connect to your boat using mounts. Don’t fancy using a BBQ grill? You could always use a fire if you have a bonfire on your site. When it comes to camping trips, water is always essential. Keep yourself hydrated. Even if you plan on bringing some beers or whatever other liquids, it’s always a good idea to keep some water with you as well. Bring a cooler with you to keep your drinks nice and cold. This is especially important on a hot summers day. None wants to drink warm water. Icey cold drinks are the way to go! This is a must if you’re bringing alcohol like beer. It’s up to you how much you want to spend on a cooler. If you have the money, you could invest into a solid ice cooler from a well-known brand such as the Pelican Elite 70 Quart Cooler. This is a worth-while investment if you plan on camping regularly or participating in any outdoors activities often. You could also purchase a cheaper cooler like the Igloo Ice Cube Roller. Though lacking a lot of features and luxuries compared to the Pelican Elite. The Igloo Ice Cube Roller is no joke and will keep your drinks cool for a significant amount of time. It has an ultratherm insulated body which does a great job in insulating the cold air. This would be the better choice if you don’t think you’ll be camping often, or you don’t do many outdoors activities. Want to take your camping trip to the extreme? Bring a water purifier and drink from a nearby water stream. Now that’s an authentic camping trip indeed. I often do this when I go camping with the family. Keep in mind that some purifiers will work better than others. Some won’t work instantly and require the water to sit for a few hours to completely kill bacteria. This makes it important that you find an appropriate purifier for the job. I’m a big fan of this Water Microfilter by COSUPA. You’ll need to stay warm during your trip. Most sites will have a fire pit somewhere so building a campfire is easy. You’ll just need some firewood and a lighter. 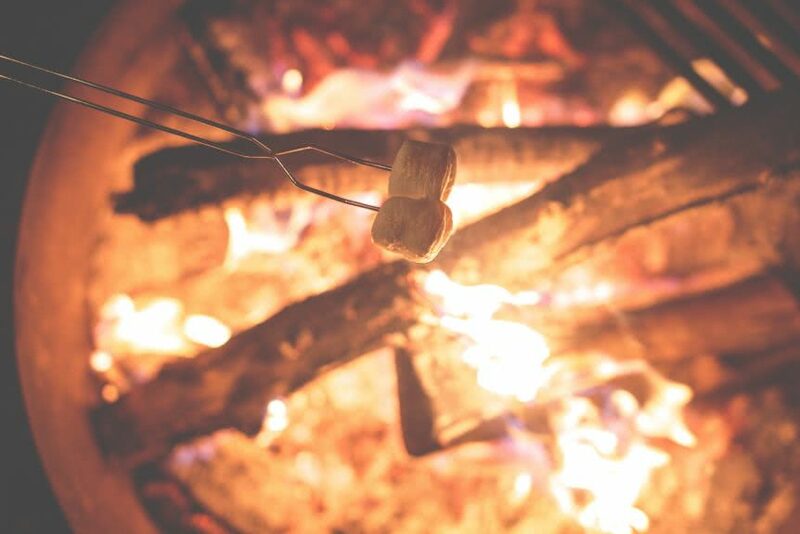 However, if you’re camping somewhere without a fire pit then you’ll need to make your fire from scratch. Another alternative heat source which could be used is a heater. These aren’t too expensive and can be used on future camping trips. You could go for a ceramic space heater or a propane heater. These are also great but don’t provide that authentic camping feel that a campfire does. Lighting is another thing which you’ll need to consider for your boat camping trip. When it gets dark you won’t be able to see anything without a light source. You might drop something and not be able to find it, or perhaps an emergency occurs, and you need to be able to see immediately. Safety lights are an important boat accessory. These are handy and can be a life saver. You may also want a torch or headlamp. They’re very portable and you could bring them off your boat if you decide to go onto land. It can be dangerous to walk around without being able to see where you’re going. This makes these small light sources essential for a safe camping pontoon camping trip. Lighting: Safety Lights, Torch, Head lamps. Warmth: Firewood, Fire starter, Lighter OR Heater. Food: Paper Plates, Plastic Utensils, Cooking Utensils, Foil, Napkins. Drink: Water purifier, Water bottles, Cooler. Cleanliness: Hand sanitizer, Paper towels, Wet wipes. Bathroom: Portable Toilet, Toilet paper. Shelter: Boat enclosure, Tent, Pillows, Sleeping Bag. Additional: Bug repellent, Foldable Chairs and tables, Extra blankets.